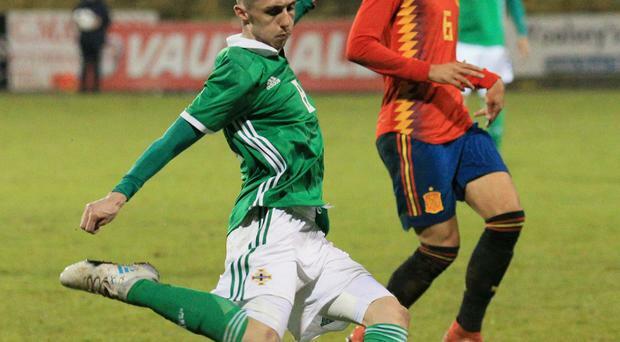 Crusaders star Gavin Whyte says the fearless performance of Northern Ireland U21s in the 5-3 defeat to Spain proves the Irish League's 'brilliant' standard. Whyte, Glenavon's Mark Sykes and former Linfield forward Paul Smyth (now of QPR) were in devastating form, key cogs in the Northern Ireland side that scored three goals against a Spain team boasting three defenders with 68 La Liga and Bundesliga starts between them this season. Whyte confirmed that the injury that forced him off is little more than cramp and that he hopes to be fit to face Iceland on Monday. It was the Crues' winger in particular that caught the eye, nutmegging Espanyol's Aaron Martin (28 La Liga starts this season) twice during a torturous second half. "He's a brilliant player but I did well tonight," said Whyte, who's hoping a performance of that magnitude against such quality opposition could forge a move into full-time football. "That's what I'm all about this season; I'm confident. You see that at club level. What I try to do is bring the club level into these games and I think I did that tonight. "It's a once in a lifetime thing (playing against that opposition) but if you're doing well against those lads, you look to go across the water and progress your career." And Whyte was adamant that his performance, along with those of Messrs Sykes and Smyth, prove that local football is in a good place. "It shows that the Irish League isn't what people say it is and that it's a brilliant standard," he said. I think Mark and I can play at a higher level and hopefully we get the chance to do that." NI Under 21s face Iceland at the Coleraine Showgrounds on Monday evening.